There’s an old business truism that goes something like, “if you want to make money buy a restaurant or a funeral home because people are always going to eat and they’re always going to die.” Sage advice, perhaps. 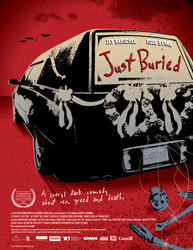 In Just Buried, the basic plot centres on Oliver (Jay Baruchel). Destined for an uneventful life, he and his brother Jack return home to attend the funeral of their estranged father, Rollie (Jeremy Akerman). Rollie, in a videotaped will, spins a wheel to determine which heir will inherit all of his assets, including the family-run funeral home. Oliver wins the spin, although we later learn it was a fixed outcome. His father wanted to be sure that Oliver would make the near-bankrupt funeral home great again  even though Oliver is scared to death of Death. As Oliver begins to deal with the financial realities of the business, and the unhappy heirs left out of the will, he turns to the funeral home`s mortician, Roberta (Australian actor, Rose Byrne) for solace. When Oliver accidentally flattens an eccentric pedestrian, he discovers that Roberta is also the county coroner. This convenient fact will eventually disguise a multitude of sins as death becomes a bit of a growth industry in small town Nova Scotia.